Contrary to popular belief that crime keeps getting worse, the statistics show otherwise. Crime rates in Britain, and much of the Western World has been falling for well over a decade now. The same scenario is playing out in New Zealand. The question is; why is this so? Many reasons are often put forward, however the proverbial elephant in the room is always overlooked. 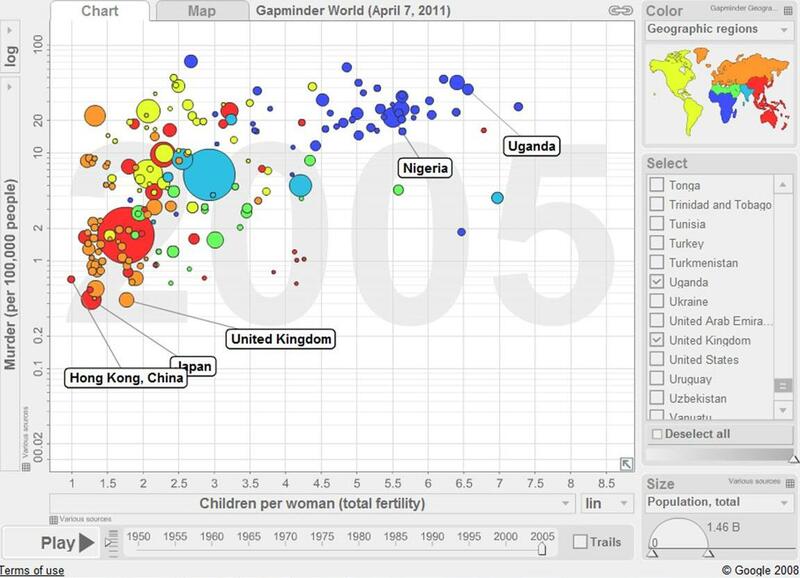 A quick look at a gapminder chart displays that countries with low fertility rates have lower levels of crime (well murder rates anyhow). Why could this be? Well lower fertility rates mean less young people, who as we know always get up to mischief, and more older people, who are generally less mischievious and more involved in civic participation. A quick look at the world news will generally confirm that where there are excess young people with too much time on their hands there will be mischief; think much of the Middle East and Africa. Whereas the likes of Japan, Hong Kong and most of Europe, with very low fertility rates, have very low levels of violent crime. Therefore, in spite of the economic doomsayers who only see the problems of an aging (or balancing) population, there are many, many, silver linings, with lowering crime rates one of them. I’d rather have Britain, Hong Kong or Japan’s economic woes due to their aging populations, than the serious social, economic and environmental difficulties that face Nigeria or Uganda with their rapidly growing populations.